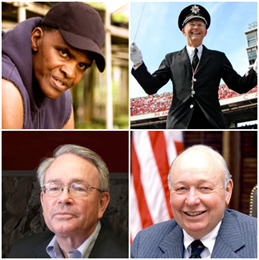 Clockwise from top left: William E. Allen, Michael Leckrone, Robert R. Spitzer, and Frederick P. Stratton, Jr. Between 2006 and 2010, the Wisconsin Historical Society recognized Wisconsin History Makers at an annual History Makers Gala in Milwaukee. A Wisconsin History Maker is a living individual who has recently made significant contributions to history in the state, across the nation or around the world. A list of recipients with links to their biographies is below. William E. Allen Receives 2010 "William Dempster Hoard Award for Distinction in Agriculture"
Michael Lekrone Receives 2010 "Spencer Tracy Award for Distinction in the Performing Arts"
Robert R. Spitzer Receives 2010 "Charles Van Hise Award for Distinction in Education"
Frederick P. Stratton, Jr. Receives 2010 "S.C. Johnson Award for Distinction in Corporate Leadership"
Richard L. Davis Receives 2009 "Spencer Tracy Award for Distinction in the Performing Arts"
W. Jerome Frautschi Receives 2009 "Jane Bradley Pettit Award for Distinction in Philanthropy"
Stephen H. Marcus Receives 2009 "Samuel C. Johnson Award for Distinction in Corporate Leadership"
Harry C. (Buddy) Melges Receives 2009 "Vince Lombardi Award for Distinction in Sports"
Pleasant Rowland Frautschi Receives 2009 "Jane Bradley Pettit Award for Distinction in Philanthropy"
Bob Harlan Receives 2008 "Vince Lombardi Award for Distinction in Sports"
Drs. Robert and Patricia Kern Receive 2008 "Jane Bradley Pettit Award for Distinction in Philanthropy"
Paul H. Poberezny Receives 2008 "Seymour Cray Award for Distinction in Technology"
Dr. Alfred (Cy) J. Tector Receives 2008 "Rosa Minoka Hill Award for Distinction in Medicine"
Dr. George Archibald Receives 2007 "Aldo Leopold Award for Distinction in Environment and Conservation"
Oscar C. Boldt Receives 2007 "Samuel C. Johnson Award for Distinction in Corporate Leadership"
Ada Deer Receives 2007 "Robert and Belle Case La Follette Award for Distinction in Public Service"
Mark Johnson Receives 2007 "Vince Lombardi Award for Distinction in Sports"
John C. Koss Receives 2007 "Seymour Cray Award for Distinction in Technology"
Paul Gigot Receives 2006 "Lucius W. Neiman Award for Distinction in Journalism and Communications"
Vel Phillips Receives 2006 "Robert and Belle Case La Follette Award for Distinction in Public Service"
Nan and George Pollard Receive 2006 "Award for Distinction in Visual Arts Given in Memory of Artist Georgia O'Keeffe"
Elmer Winter Receives 2006 "Samuel C. Johnson Award for Distinction in Corporate Leadership"